one of Nature's most effective pain relievers. Our sister Juliette lives in the historic mountain town of Bisbee, Arizona where she makes artisan sourdough populated with the wild yeast of the area. Her business is called Guadalupe Baking Company, and most days she is up in the wee hours of the morning to tend to her bread which she sells at local farmer's markets and to local vendors. This month she is also being featured in the new September issue of Edible Baja Arizona which is publishing an article on Juliette and her killer bread. Juliette photographed by me during a recent Sistercation in the Fall of 2012. What most people probably would not know about Juliette, since she can be a little "crusty" just like her bread, is that there is a poet that lives deep inside her which she lets loose every now and then. She's quite the dancer, too, when she decides to get her groove on. Back in the summer of 2000, Juliette befriended two young women who were living in Bisbee for a season to attend the Southwest School of Botanical Medicine founded by herbalist Michael Moore, who is one of my personal heroes. I, on a lark and attempting to escape a troubled relationship, moved to Bisbee in the fall of 1998 after securing a job as a graphic artist with a small local company. The six months that I spent in Bisbee quite possibly helped bring Juliette's already shaky marriage to an end in 1999. Juliette's ex and I just didn't really ever see things eye to eye on most subjects. Like most divorces, it was painful and unsettling. After I had moved back to California, having decided that Bisbee just wasn't the right place for me after all, and after her husband had finally moved out, Juliette unleashed a torrent of poetry that happened to coincide with the annual monsoons of the following year. In the time that followed, Juliette wrote and described the feelings she was experiencing during her transition into her new life. I am including a poem of which I am particularly fond of from that summer. She wrote it in the aftermath of those difficult days, and I find it both poignant and beautiful. In it she expresses her wistfulness and wonder at the beauty and the fleeting nature of youth, while she struggles to regain her balance and reinvent herself anew. Reading this poem never fails to make me get a little misty. 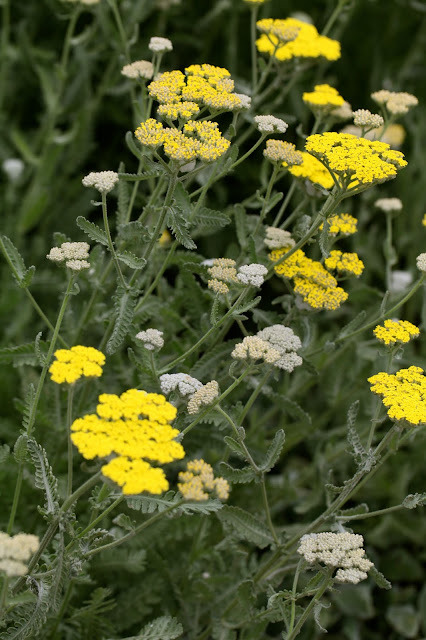 Yarrow~ Nature's wound healer and psychic shield. This finch is no fool... elderberries are delicious and antiviral. 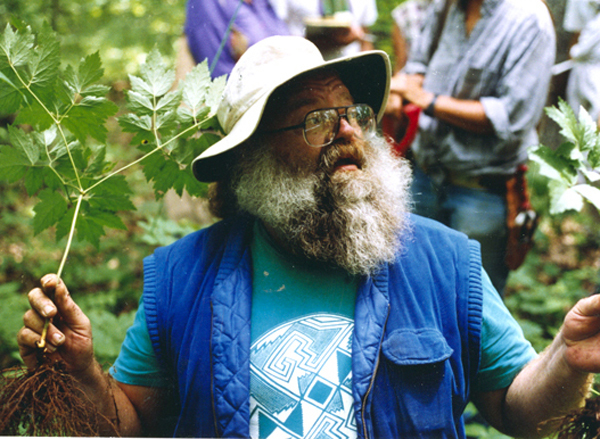 I cannot let this opportunity pass without mentioning the life and work of herbalist and teacher Michael Moore who died in 2009. Michael was the author of many books dedicated to teaching herbal medicine and to the practice of herbalism, as well as founding the Southwest School of Botanical Medicine which was located first in Albuquerque, New Mexico and later in Bisbee. However, what he is most recognized for (in addition to his books) by herbalists like me, is the website of the school which is now administrated by his wife Donna Chesner. The site contains many historical manuscripts that Michael posted and made available to the public free of charge. It is a tremendous resource for students of herbal medicine in that it has preserved knowledge which might have been lost to time and obscurity before there was a renaissance in the study of herbal medicine. Thank you, Michael. Angelica Archangelica has a long history of cultivation for its sweetly scented stems and roots. Nopal (cactus) is good eats and also helps balance blood sugar as an added benefit. derives from the Latin word salvere which means "to feel well and healthy". When many people think of herbal medicine, they have the misconception that herbal remedies are a mild and somewhat inferior form of medical treatment. Often they think that the prescription drugs that their doctors give them will work more effectively, even while recognizing that they may have the down side of having harmful side effects. In my experience I have found herbs, in many cases, to work better than drugs and with the up side of supporting the body with no harmful side effects. Mark gives the finished oil a try. Men also love these oils. Most likely you have heard of aromatherapy. The word aromatherapy is being bantered about these days by any company in the main stream who is pitching their fabric softeners, plug-in air fresheners and candles that usually contain synthetic fragrances that have no medicinal benefit whatsoever. I prefer the term "aromatic medicine" which uses pure essential oils that are incredibly effective for preserving vibrant health and treating ailments. I have been using essential oils for over 20 years now, and I keep a "library" of them in my medicine cabinet. Essential oils are a very powerful form of herbal medicine. I use them for everything from stomach ache to insomnia, and I keep a good selection on hand at all times. I have several essential oils that I always take when traveling… lavender and tea tree oils are good examples. Over the years I realized through my research that essential oils are wonderful for protecting our skin from aging (wrinkling). I prefer to add my own essential oils to a ready made carrier oil base, so that I do not need to purchase all of the individual seed and nut oils individually. They go rancid rapidly, and I prefer to purchase them as needed for freshness and convenience. Essential oils are expensive, and most companies go light on the amount of essential oils that they add to their products for this reason. I choose excellent quality face and body oils and then boost the essential oil content to my personal taste for maximum effectiveness. My simple recipes begin with excellent quality body and face oil and pure essential oils. I have been selling herbal supplements and body care products to people of all ages for many years. I often find that people in general and especially teens are afraid of applying oil to their skin. The common misconception is that using oil on their skin will make their skin even more oily. Adolescents in particular, tend to over-cleanse their skin when they start to get pimples or acne. When they use harsh soaps and astringents to clean their faces and bodies, the sebaceous glands under the skin retaliate by producing even more oil in order to help protect the delicate skin that has been stripped of all of its protective layer. Instead, a better approach is to apply a few drops of oil to gently cleansed skin while it is still moist. Allow the oil to absorb into the skin for a minute or two, and then blot with a towel if needed. This will balance oil production of the skin, and the essential oils effectively treat the cause of the breakouts. Getting ready to add the essential oils to the oil bases. In making my face and body oils I begin with an excellent oil blend from Duchess Marden® for my face oil and and a wonderful oil blend from Badger® for my body. I chose these oils as my bases because they each have a blend of high quality seed and nut oils and essential oils. It is easy for me to then add high quality pure essential oils to introduce the properties that I wish to emphasize and to add them in to my chosen concentration. Anything that we put on our skin is very quickly absorbed into our bodies. This is the main reason for choosing body care products that are free of synthetics, chemicals and dyes. Europe has strict standards in regard to body care ingredients, because it is widely recognized at this point in time that transdermal absorption is a proven fact, and that many additives to drug/department store body care brands are harmful to our health. These chemicals are used because they are inexpensive. The United States has not so far, introduced the same regulatory standards as can be found in the production of European products. Adding the Moroccan Blue Chamomile oil will change the color of the oil base (see the first photo). An additional benefit of putting these essential oils on your skin which are then absorbed into your body's tissues and blood steam, is that the essential oils that I use are anti-inflammatory. It is my belief from the research that I have done, that the essential oils are protecting me from inflammation elsewhere in my body… especially important for breasts and joints, as well as all internal organs. The carrier oils that I use are not inexpensive! If cost is an issue, use a high quality olive oil, or a mix of olive and jojoba oil. There is no getting around the expense of the essential oils, but the good news is that they are concentrated, and will last. You only need a few drops of each per bottle. A word of caution. Essential oils should not be ingested unless prescribed by a Naturopathic Doctor. Some of the oils should not be applied directly to the skin with out a carrier oil to dilute the essential oils. Use care around the sensitive eye area, and do not get them into your eyes. Keep away from children and use only when properly diluted. It is important that you choose good quality essential oil, and I like to buy organic when available. A few companies that I recommend are Simplers Botanicals, Floracopeia, and Oshadi. Do your research. Not all essential oil companies are ethically sourcing their products! Add the essential oils to the bottle of Duchess Marden® Anti-Wrinkle Serum. Return dropper cap to bottle and shake a couple of times until the essential oils are incorporated. Store in a dark and cool place. Use a few drops on freshly cleansed skin being careful to not get it into your eyes. 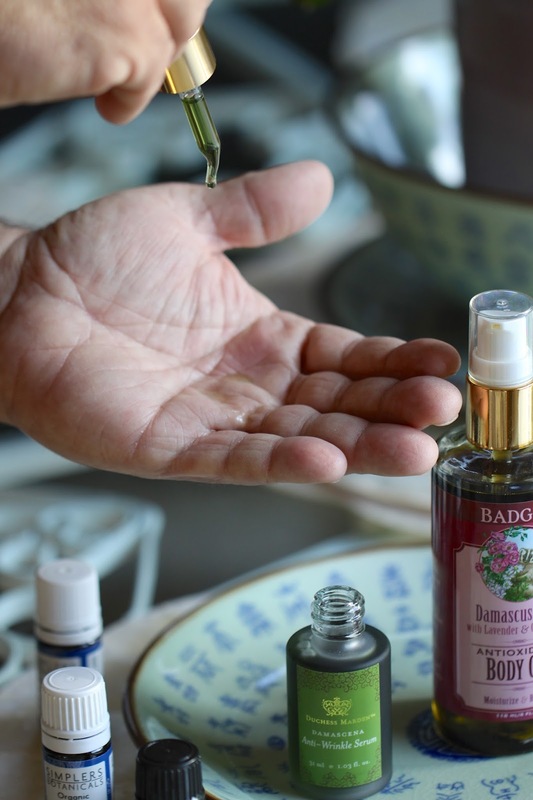 Add the essential oils to the bottle of Badger Damascus Rose oil. Return dropper cap to bottle and shake a couple of times until the essential oils are incorporated. Store in a dark and cool place. Use a few drops on freshly cleansed skin being careful to not get it into your eyes. A final note. The body oil is more viscous and is stronger in essential oil, but can be used on the face if your skin is not super sensitive and you are looking for a heavier weight oil. For sensitive skin, essential oil amounts can be reduced. The carrier oils and essential oil blends can be reconfigured to suit your personal taste and needs. Have fun experimenting with different oil blends. My mostly unlined 56-year-old face can attest to the fact that essential oils help keep the wrinkles away. Me in the fall of 2012 at age 55. Moroccan Blue Chamomile Essential Oil: Having the most chamazulene of all the blue oils, Moroccan blue chamomile has an intensely sweet scent and deep blue color. 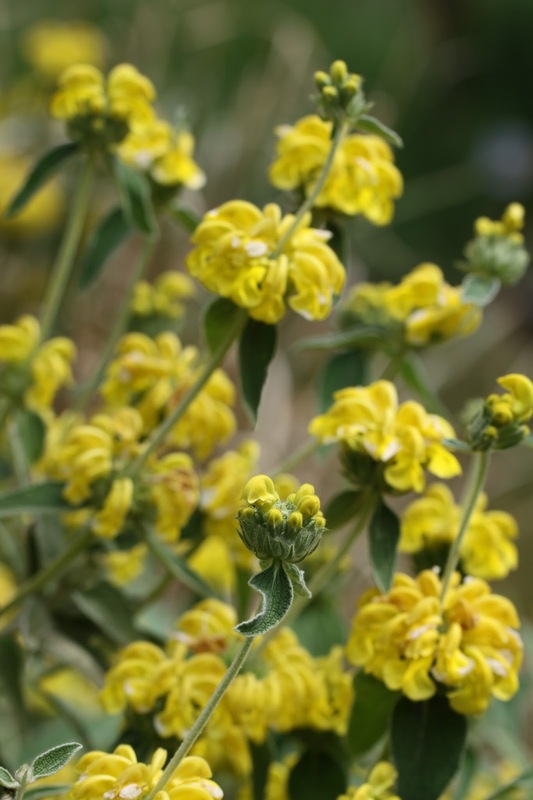 Valued for its natural antihistamine effect when dealing with hayfever, asthma and hives. Anti-inflammatory, antiallergic, non-specific red rashes and mild antiseptic. Use for eczema and dry skin. Helichrysum Essential Oil: Also known as Everlasting or Immortale. Distinctive warm, herbal aroma with pungent undertones. Used for sensitive, inflamed, irritated skin, bruises and sprains. Strong anti-inflammatory, best vulnerary and antirheumatic. Blends well with lavender, rosemary, eucalyptus citriodora, yarrow, chamomiles. David Crow of Floracopiea, who was a teacher of mine, refers to Helichrysum as the world's most healing oil. Neroli Essential Oil: True orange blossom is a rich yet delicate warm floral with deeply soothing effects. Tonifying for most skin types, but especially mature skin lacking vitality and suppleness. Blends well with many oils, including chamomiles, jasmine, ylang, rose, geranium, woods and citrus. Lavender Essential Oil: A gentle oil with a soft, floral herbal scent, known for its calming, relaxing & soothing effects. Considered the most universally useful oil, it is excellent for all skin types. A must for every first aid kit, it can be used for burns, sunburns, stings, muscular aches, cuts, blemishes, bruises, headaches, insect bites & menstrual cramps. Promotes deep restful sleep. May be applied neat (undiluted) to the skin. Lavender is used in France as a base or carrier oil for other essential oils to be diluted in. Where to Locate The Subject of Yeasts!! on The Michael Moores' Botanical Web Site?? There used to be a Treaty of in-depth information talking about the spores and uses for Baking Yeast spores and someone ... ( decided ) ... to Punish Helen Keller ( again*, ) !! ... by moving The Furniture !! well at least Michael would LAUGH !! ... we all miss him ... too !